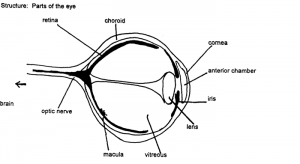 Colobomas of the retina cause visual field defects in the upper visual field. They also predispose the patient to retinal detachment. Colobomas of the macula and/or optic disk usually affect visual acuity significantly. Facial palsy can result in lack of blinking and resultant dry cornea which can lead to corneal scarring. Accurate description of visual acuity and visual field are of paramount importance for educational and communication purposes, particularly since most children with CHARGE have mild to profound hearing loss as well. Regular (yearly) ophthalmologic evaluations to assess changes in visual acuity, refractive error, and potential for retinal detachment. Parents should be informed of the risk of retinal detachment and the importance of immediate medical assessment if there is any change in the vision status of the child. A diagram of the visual fields should be given to families and vision teachers or therapists so that communication programming will be optimized. The visual field may be a crescent-shaped area of the lower visual field. Some children will tilt their heads back in order to compensate to see. Accurate assessment of the most comfortable head position for viewing objects is important. Many children with CHARGE are sensitive to bright lights. Sunglasses can be very helpful in making the child more comfortable. Often the child appears to see better than would be predicted based on results of formal acuity and visual field testing. Many children who are legally blind function quite well visually. The parents and teachers usually can provide an excellent description of what the child can see. Demonstrate for parents what the vision is with best correction to help them understand what the child can and cannot see. For instance, parents frequently misunderstand that children with high myopia can see object moving at a distance when lighting and contrast are adequate, but cannot see detail clearly. In this situation, parents often have the impression that the child is not significantly visually impaired, when that is not the case. Most children with CHARGE have multiple anomalies, especially hearing loss. Significant vision problems combined with facial palsy, deafness, and inability to communicate may result in autistic-like behavior. However, once vision and hearing have been accurately assessed and an appropriate communication pattern established, such behaviors are often extinguished. Evaluation by a deafblind specialist (not simply a low-vision specialist) is essential. Blake KD, Davenport SLH, Hall BD, Hefner MA, Pagon RA, Williams MS, Lin AE, Graham JG: CHARGE association: an update and review for the primary pediatrician. Clinical Pediatrics 1998; 37:159-174. Blake, K. D.; Russell-Eggitt, I. M.; Morgan, D. W.; Ratcliffe, J. M. and Wyse, R. K. H.: Who’s in CHARGE? Multidisciplinary management of patients with CHARGE association. Arch. Dis. Child.65: 217-223, 1990. Russell-Eggitt IM. Blake KD. Taylor DSI. Wyse RKH. The eye in the CHARGE Association. Brit J Ophthal. 1990; 74:421-426. This does not affect vision, but may make the child more sensitive to light (photophobia). This will result in large blind spots, usually in the upper field of vision, (as if the child were wearing a baseball cap). Many children with retinal colobomas prefer to be upside down and to bottom-shuffle, in part because that way they can best make use of their available visual field. This often results in blurry vision as well as large blind spots. Children with extensive colobomas are often legally blind (20/200 acuity or worse). They may not look directly at objects or establish eye contact because of poor central vision. This can be associated with large colobomas of the retina. Any coloboma of the retina or disk puts a child at increased risk of retinal detachment. Any sudden change in vision should be treated as a medical emergency. Loss of vision can result if not corrected. Infants with decreased vision will have delayed motor milestones. This is especially true for children with CHARGE, who often also have hearing loss, vestibular (balance) abnormalities and serious medical problems requiring multiple hospitalizations and surgeries. Communication can be complicated by vision problems in children with CHARGE. Because of the hearing loss, sign language, speech reading and other visual communication is often used. Decreased visual acuity can make this more of a challenge. Retinal detachment can often be treated surgically if it is correctly diagnosed shortly after it occurs. Suspected retinal detachment should be regarded as a medical emergency. Amblyopia may be treated with patching; strabismus may be treated with surgery. Refractive errors that reduce visual acuity can often be helped with glasses. Photophobia can be helped by using tinted glasses, indoors as well as outdoors. It is important to know the extent of your child’s visual field. If there is very little vision in the upper portion of the visual field, sign language and objects the child may want to see must be placed in the lower half of the visual field (in the lap). Many children compensate for small visual fields by adopting a certain head position or body position. 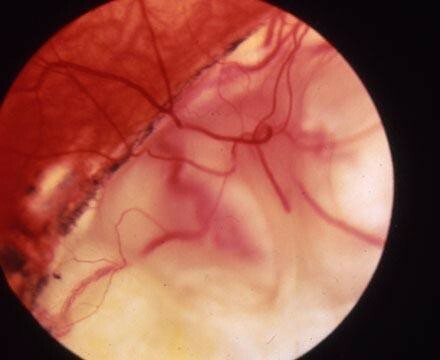 The picture above is a retinal coloboma.